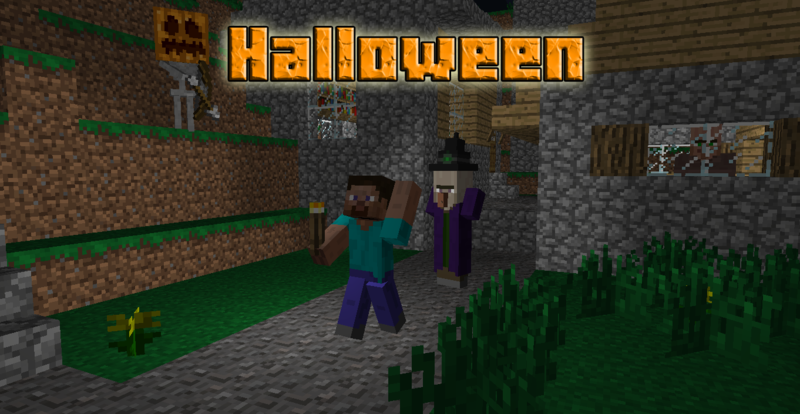 This is a simple plugin for adding Halloween to your Minecraft server ! Current version : v0.7.1, Statut : Approved. /scare <Player> [ID] - halloween.scare - Scare <Player> with the event [ID] (see below). /haunt <Player> [time] - halloween.haunt - Haunt <Player> (see below). You can use Vault for these permissions ! halloween.events.bypass - Allow you to bypass random events. halloween.curses.bypass - Allow you to bypass curses. Worlds - Choose the worlds where you want to enable the plugin. Sounds - For random sounds, choose the sounds you want to be played. RandomEvents - [true | false] - Choose if you want to add random event on your players. PermanentNight - [true | false] - Choose if you want the permanent night. SoundOnLogin - [true | false] - This will play a random sound when a player join a world enabled. CreaturesWearPumpkins - [true | false] - If you want the creatures wear pumpkins (added when they spawn). SpawnWithPumpkin - The chance (in percentage) that spawn creatures with pumpkins (not added if the option above is disabled). Storm - [true | false] - Choose if you want permanent rain. FakeLightning - [true | false] - This will make fake lightning. MaxRandom - [true | false] - In seconds, the max time between two random events. EnableUpdater - [true | false] - Choose if you want to enable the auto-updater. HalloweenMessage - The message in the random event ID 4. So what are random events ? 1. A random sound played near the player. 2. A lightning effect on the player. 3. A pumpkin on his head for 3 seconds with a little scarry sound. 4. The message "Happy Halloween !" (configurable) with four bats. 6. Spawn a flying Jack O'Lantern at the player location. 7. A trap is set to the player : an anonymous man ask help him and give his position but when the player go to this position, there is a lot of monsters. 8. A random player ask some help to the player and in a delay of 5 seconds, a fake message which say that the random player is dead is sent to the player and the Grim Reaper is spawned. (If you are alone on your server, you will have a surprise ;) ). The Grim Reaper disappeared in a delay of 10 sec. 9. The player is teleported 256 blocks over his location. He is teleported back in a delay of 10 sec. And what are the curses ? 1. Break a torch in a random delay (max : 15 seconds) when the player place it. 2. Spawn a baby zombie when a player hatched an egg. 3. Spawn a bat when the player open a chest. If you have a YouTube channel and you want to make a video for this project, feel free to post it in the comments. You want more random events / curses ? This plugin uses the Gravity's auto-updater too. That is all, good game ! Could you post this on Github? Do you plan on updating this any time soon? If so, could you add a toggle option for each of the random effects? Aww it'd be the best thing ever. Thanks though. not sure if this is still being monitored. I have added this plugin to my server for Halloween however I keep getting the note "This player is on a world where the plugin is disabled" when trying to run the /scare or /haunt command. I checked the config and it appears that the config file keeps defaulting back to the original config file when I restart my server. Is there any way to fix this so that I can use this plugin? so is this plugin still good? No, it is not possible, sorry. I set up multiple worlds, but only one world is affected by random lightnings. Is it possible to activate a function like "thunders and lightnings without rain"? Bonjour ! Quand on utilise le /scare numéro 9, on est téléporté en haut, on tombe, puis on est téléporté en bas, et j'ai l'impression qu'on garde la vitesse de chute de là-haut, parce qu'on meurt de chute. Est-ce qu'il est possible de régler ça ou d'enlever des évènements en particulier ? Could you add Resistance X to the player when they get tp'ed all the way up? Il y a un problème lorsqu'on désactive la persistance de la pluie, la nuit n'est plus éternel. Je suis obligé de mettre la pluie pour que la nuit persiste. Un bug vu qu'apparemment l'un ne va pas sans l'autre..